LA PAZ and EL ALTO, Bolivia — In these two cities, geography and rank stand in inverse relation. La Paz — the seat of government, old money and a lighter-skinned elite — sits in a valley. Above it on a high plateau is the frenetic city of El Alto: poorer, younger and generally darker-skinned. La Paz has always looked down on its upstart younger sibling above. Now, that relationship is being challenged, and this urban Möbius strip, where down is up and up is down, is getting a new twist. A mass-transit aerial cable-car system, a cross between a ski gondola and an elevated train, is being installed to better connect them, chipping away at the physical barriers and possibly some of the psychological ones. 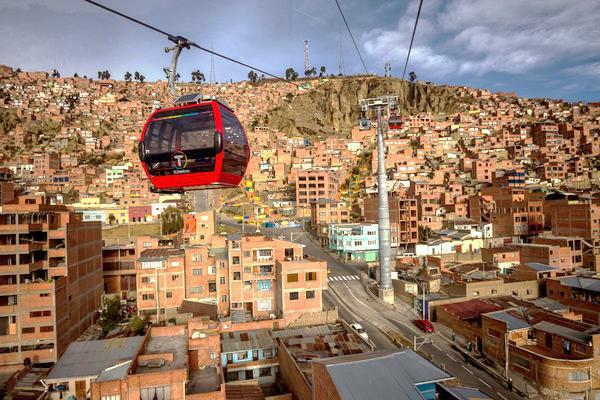 Much as the subway system changed New York in the early 20th century, the cable-car system has the potential to transform La Paz and El Alto, connecting distant neighborhoods to the city center, raising real estate values, slashing commute times and altering social relations.